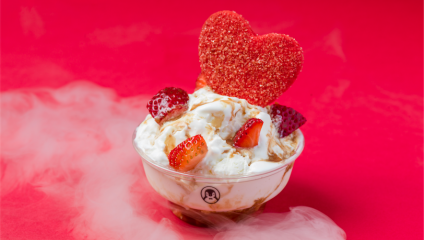 Nab a free ice-cream from Four Winters this Valentine’s Day! Want to make your Valentine's Day sweet? Want to make your Valentine's Day sweet? London Calling is here to let you know how to get your fix on February 14. London’s most Instagrammable ice cream purveyors, Four Winters, have partnered up with Mazzetti to create an aphrodisiac serve that’s sure to warm even coldest of hearts. The limited-edition flavour is available from the 7 – 18 February, but the unlikely duo are giving away free ice cream cones this Thursday from midday on a first-come, first served basis. Created one cone at a time, every portion is lined with a balsamic caramel sauce and fresh strawberries before Mazzetti Balsamic Vinegar of Modena is then drizzled onto the strawberries and cream blend. A handful of strawberries, balsamic caramel and a heart shaped shortbread biscuit top the creation. Both balsamic vinegar and strawberries in the Berry Balsamic contain natural mood-boosting aphrodisiac qualities, making the them the perfect pairing to see sparks fly during for a romantic night with your loved one - don't miss out!